For the biotech entrepreneur looking to raise funds for a new start-up, pitching to a venture capital firm seems like a straightforward process, right? Highlight your management team, the unmet need, your development plan and the potential return to the investors. Not so fast. The biotech VC industry is being seriously squeezed at the moment: limited partners are shying away from biotech investments and profitable exits are becoming scarce as the public markets and big biopharma companies push down valuations. Biotech VC firms are still making investments of course, however, they are using much different selection criteria. So what should a biotech entrepreneur do to increase the odds of getting VC funding? It starts with an understanding of what biotech VC firms don’t want. As the cost of drug development continues to rise, biotech VC firms are increasing their focus on capital efficiency. You want a ten million dollar financing round to set up a new lab, hire a team and run a variety of preclinical studies? It’s probably not going to happen. VC firms want to see a development plan that will get them to a meaningful milestone as quickly and cheaply as possible. Need to hire another scientist to run a preclinical study? Forget it, outsource it to a CRO. Want to test your drug in one more animal model? Don’t bother unless it’s critical to reaching your next milestone. Get familiar with terms like “lean proof-of-concept” and “virtual biotech”. Biotech VC firms don’t just want to know what you’re going to do with their money, they also want to know how they’ll get their money back (hopefully with a healthy return). You may have dreams of your own NASDAQ ticker symbol, but if you want VC funding, don’t even think of mentioning an IPO as an exit option. Why? The chart below from BIO answers that question. 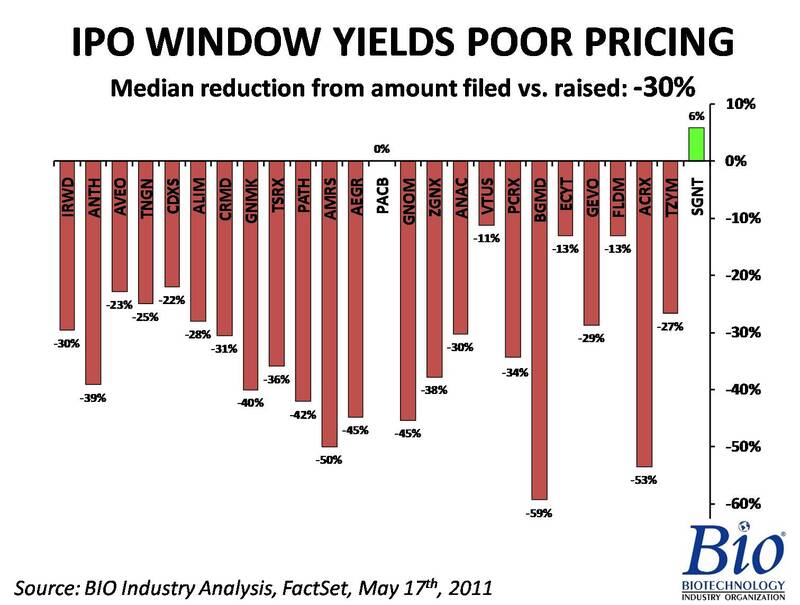 Since the IPO market reopened in 2008, almost every biotech that has gone public has been forced to take a very large discount on their target price. This not only reduces the VC firm’s return, but the smaller amount of capital raised often puts a fear in the public markets that the biotech will have to do another dilutive financing round just to raise enough capital to reach the next development milestone. This just depresses the share price even further. So we know that biotech VC firms want to understand how they’ll exit their investment, but an IPO is out of the question. Maybe the biotech entrepreneur should just focus on an “acquisition” or an “out-licensing deal” with a big biopharma company as an exit? That won’t cut it. The days of biotech VC firms investing without a detailed and carefully thought out exit strategy are long gone. A much better approach is to include specifics: Who are the potential buyers of your company? Does your technology fit with their portfolio strategy? Does your development milestone provide a candidate profile that acquiring companies look for? How much do they usually pay for an acquisition? How do they structure it? Do they pay in one lump sum or do they provide a small up-front payment followed by a series of earn-outs? The more homework you do and the more you can make the VC firm believe in your exit strategy, the better. You may be thinking “Not all VC firms are the same! I’ve got a game-changer here and the rules don’t apply to me.” That may be true. Not all VC firms are the same and this article only addresses the broad trends occurring in the industry. However, the more you understand the challenges being faced by biotech VC firms and address them in your pitch, the more likely you’ll secure the funding you need. This post was taken from an article I wrote for the Dartmouth Entreprenurial Network newsletter, which can be found here.